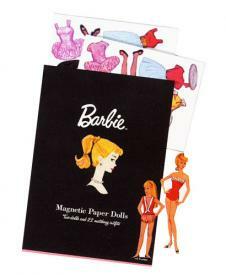 My Family Fun - Barbie paper dolls Reproduction of the Barbie from 1964 and other paper dolls! Reproduction of the Barbie from 1964 and other paper dolls! This is a reproduction of the Barbie and Skipper paper doll set from 1964. The folder set is like the paper doll sets of the 1950s and 60s with a pretty cover and pockets inside to organize the dolls and clothes. This set includes two magnetic dolls and 22 matching outfits.